Welcome to this month's book club, guys! It's supposed to go down on Thursday and today is Friday, so I hope you will excuse my tardiness. Hopefully those of you who read the book or are interested in introverts v. extroverts are stilling hanging in the wings somewhere and will read and enjoy this post. I was really interested in this book because I consider myself an introvert. And, we all know the derogatory stereotyping of introverts. Cain's purpose in this book is to describe and explain the psychology of introverts and extroverts, and what is at their center. She wants to show how introverts are undervalued and how we can help them see their potential and learn to work with them. Cain does a very good job explaining how the minds and personalities of introverts and extroverts are different. She is also very easy to read (except for a few parts). I was able to place myself and my husband into the roles of introvert and extrovert, which made it more compelling. She described what motivates the two different groups, how shyness and anxiety come into place, the difference between personality and temperament, and how there is an elasticity reach. I liked learning about famous people who happened to be introverts, like Eleanor Roosevelt and Gandhi. I am so happy she mentioned extroversion and evangelicalism. Cain met with a few in the Evangelical church who were self-proclaimed introverts. They had a hard time feeling like they fit in because the church is all about shouting their faith from the mountaintops and proclaiming to the world. Cain also brought up introverts in a school setting. I loved that she spent almost two whole chapters dedicated to introverted youth. She was very careful in her proclamations that the way education is set up, especially with group learning being a key focus. Cain, herself, is a self-proclaimed introvert. And she obviously wanted to show the power of introverts. But, although she had a lot of sources and studies, she was pretty biased. She made sweeping generalizations that introverts are smarter and more creative and extroverts are rash and just bombastic. There were sometimes that the scientific studies were hard to understand. I wish she would have talked about any relationship and effect confidence had on being an introvert or extrovert. It also sometimes got confusing when she mentioned all the different people she interviewed. She would go back and forth between interviews to prove her point for that specific chapters, and go back and forth between using last names and first names. I learned a lot about myself from this book. I could write a large report about all my thoughts--we had a straight two hour talk about this book at our In Real Life book club on Tuesday night, with no breaks or breathers at all! And, we could've gone longer! The biggest pull away was the fact that being an introvert doesn't necessarily mean you are a recluse and anti-social and that being extroverted means you always have to be the center of attention. Cain kept going back to the clarifying point that what makes the two is where they get their energy from. Stimuli, like activity, noise, people, images, etc. makes extroverts. They get excited and full of energy from social events. Whereas, introverts get re-energized from being a lone, in-depth conversations, reading, soft sounds, sleep, etc. People drain them. I definitely am an introvert, and have always been so, according to this definition because I always feel re-energized reading, or listening to soundtracks, or being in nature and going to group activities drain me. The other thing that I pulled away is that people don't necessarily change. Their environment and situation changes, but their temperaments don't, and being an extrovert or introvert are part of temperament. That means, I have always been an introvert. But, I wonder if my anxiety disorder, which has gotten worse the older I have gotten, played a part in me pulling away from extroverted tendencies. Cain also mentioned that there is a spectrum of introversion and extroversion. I'm not super introverted--I do enjoy hanging out with friends, going to parties, and getting out of the house. But, after a certain amount of time, I am done. Whereas, my friend, Aubrey, is super extroverted and hates any down-time she has. Cain also shows that you can be more extroverted in different situations. I have never been nervous giving a lesson or talk in church. I have never been nervous teaching or while I was being observed for teaching evaluations. You may even say I am very comfortable in the front of a classroom. But, put me at a table of people I don't know, I get nervous and don't know what to say. I really loved this book, and wrote a lot in the margins, and I'm sure I'll go back and re-read it every now and then. And now... my thoughts on the book! I have been interested in this book for almost a year when a friend first recommended it to me. I have not been shy to say that Greg and I are very different on the introversion/ extroversion scale. Greg is very introverted and I am very extroverted. So I thought, if nothing else, this book could help me understand Greg better. And it did! I felt like there were several "ah-ha" moments. I do wish I would have read this book four years ago... it seems like a lot of the introvert/extrovert breakthroughs we made the hard way. Still though, I learned a lot, and if nothing else it was extremely validating. The most interesting thing for me about the book and the biggest "reveal" was when Cain talks about introversion and extroversion being the way that our brain reacts to stimulus. I thought this explained a ton about mine and Greg's relationship. Greg is very social and is the life of the party whenever we go out. His students loved him and he was always making them laugh. But this drains Greg and it is often hard for other people to see. 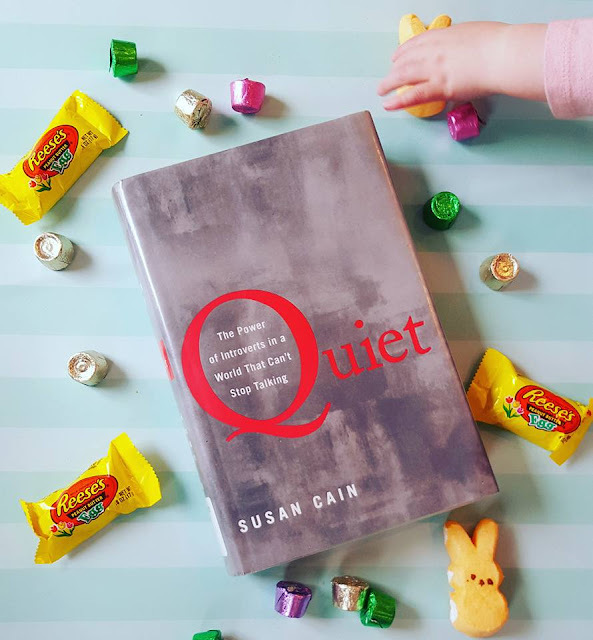 According to studies done that Cain mentions, this can be because of high reactivity- meaning that introverts are likely to react more strongly to their environments. They are more sensitive to the stimulus around them and therefore more quickly "overstimulated". Which is why big crowds, lots of noise, endless small talk can be totally exhausting to introverts- it's so much stimulation. It'd always be frustrating to me that after any kind of activity Greg would want down time, but this book makes it pretty clear that the high-reactive brain it just on overdrive and needs some time to settle down. Cain talks A TON about introverts in the work place, what to do to foster creativity for introverts, how to help them, etc, etc, etc. Like Tayler mentioned, at times I was frustrated, like Cain was trying to prove to the whole world that introverts have been done wrong and they are these quiet geniuses that no one appreciates. I thought her information about group work at school was very interesting, too. Basically it made me rethink everything about the way I do groups and already I am transitioning to much smaller groups- three max, but preferably partners. I don't want my smart introverts to be bowled over by the loud extroverts who may not have a clue. There was one chapter on introversion in relationship and one chapter on introversion in children... I wish she would have talked about this much more as that was what was the most interesting to me. I highly suspect June to be an introvert and obviously my husband is an introvert so I'd love more ideas of how to make everybody happy in situations like this. I felt like basically her solution was, "Woman wants go out every Friday night. Man wants to stay home every Friday night. Compromise and go out every other Friday night." I mean, come on, you gotta come up with some solutions that are not quite so obvious as that! Overall I really enjoyed the book. There were parts that dragged a bit and I think Cain got into her own self and desires a little too much, but I'm glad I read it. Like Tayler said, we talked for over 2 straight hours at our IRL book club, so I'd say it was pretty successful! Alright, time to share your thoughts! Have you read the book? Are you an introvert? Or do you love someone who is introverted? How have you made introvert/extrovert relationships work? And next month we are reading Attachments by Rainbow Rowell. I read the first 40 pages last night and had to force myself to put it down, so I'd say it's going to be a good one! Our IRL book discussion will be April 26 and the online book discussion will be April 28. Oh, and you can link up your post, too, if you wrote one!